Richard Ruth returned from the 45th reunion to find a letter from Gretchen's brother Kent who reported that Gretchen died at home on July 28 in Hailey, Idaho. 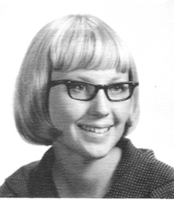 Gretchen Louise Rust, 63, of Hailey, died July 28, 2010, at her home in Hailey. Funeral services are pending under the care of Wood River Chapel of Hailey. Here are some condolences for Gretchen from her friends which mention her two sons, Jeff and John. My condolonces to the boys, and siblings. I caught up with Gretchen several years back as I drove home from a Christmas in Bend. We'd kept in touch since then, occassionally she'd call and catch up with me, and ironically I'd been thinking lately I hadn't heard from her in a while and should give her a call. I'll remember fondly a young Gretchen who was in my youth group at the little Presbyterian church near Highland View. Talking over the Corvallis years I mentioned once that she was on the inside circle, and she laughed loud and said, "oh God no, I wasn't part of that!" which gave us both a good laugh. So, that raspy truck stop waitress voice from all those cigarettes she wouldn't quit is silent, and I for one will miss her. Farewell Gretchen. Click here to see Gretchen's last Profile entry.